The crew of Diminuendo and her guests were treated to a beautiful evening in Active Cove with a wonderful view up the Strait of Georgia. 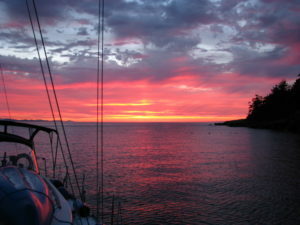 The San Juan Islands provide an endless array of magnificent vistas. Sunsets in the San Juans are not always like this, but it just makes us appreciate them all the more when Mother Nature does grace us with one so beautiful! We often sail by Patos Island on the way from Sucia to Stewart Island to treat our guests to one of the breathtaking view of the Patos lighthouse with Mount Baker looming in the distance. This time we decided to drop the hook and spend the night at anchor in Active Cove. The cove is a bit small so we’re not always able to find room. There are 2 mooring buoys and just enough room for a couple of boats to anchor out. In choosing you spot, one must consider the currents which can be quite strong, especially on a spring tide such as we had on this occasion. One advantage of offering only private charters is that it allows us to change our plans as opportunities present themselves. As Captain Ron likes to put it, “leaving navigation to chance, circumstance, and whims.” Were we to offer “by the cabin” cruises, we would have to stick to a set itinerary or try to reach a consensus among the different couples sharing the boat. From our vantage point in the cove, we could see the Patos Lighthouse as well as the lighthouse on Saturna Island across the border in the Canadian Gulf Islands. Genaro and Stacey were a real pleasure to have aboard. Genaro is an expert drone videographer, and we will soon have some aerial video of our adventure to share!